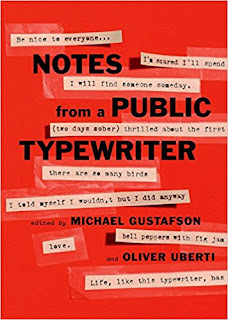 Synopsis (from Amazon): A collection of confessional, hilarious, heartbreaking notes written anonymously on a public typewriter for fans of PostSecret and Other People's Love Letters.When Michael Gustafson and his wife Hilary opened Literati Bookstore in Ann Arbor, Michigan, they put out a typewriter for anyone to use. They had no idea what to expect. Would people ask metaphysical questions? Write mean things? Pour their souls onto the page? Yes, no, and did they ever. Every day, people of all ages sit down at the public typewriter. Children perch atop grandparents' knees, both sets of hands hovering above the metal keys: I LOVE YOU.Others walk in alone on Friday nights and confess their hopes: I will find someone someday. And some leave funny asides for the next person who sits down: I dislike people, misanthropes, irony, and ellipses ... and lists too. One (or more) Sentence Summary: This is the coolest book. 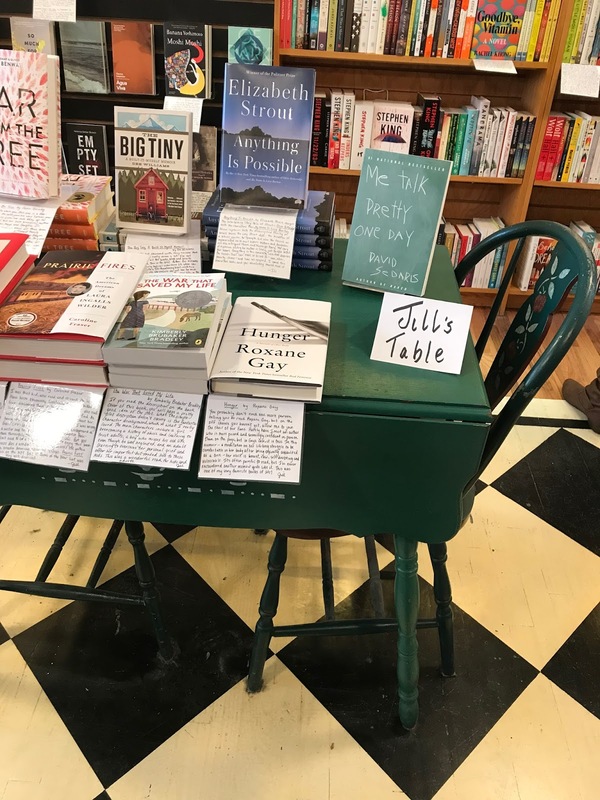 The owners of an awesome bookstore, Literati Bookstore (in Ann Arbor) published Notes From a Public Typewriter. I go to Michigan often since I am from there, my family all still lives there. I also go up a lot for hockey and once I learned about the bookstore, it was a must stop during the next hockey trip. I fell in love with it and even sat down at the typewrite and typed! 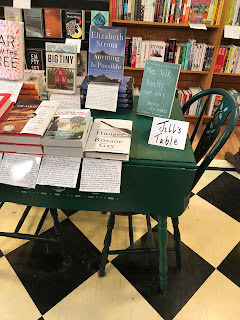 The main floor even has a table - labeled Jill's table (I felt right at home). The second floor has a coffee shop and children's books. The basement houses more books and "the typewriter." The owner talks about the bookstore's ghost and I think it lives in the basement. There was a just a feeling! Maybe it is the lighting? 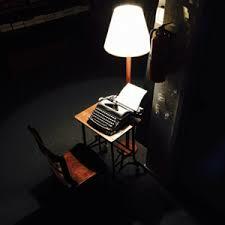 Notes From a Public Typewriter has different chapters that take us on a journey. We get to experience the meaning of the typewriter, seasons, new love, self discovery, new friends, advice, poems, jokes and sad events. Each chapter starts out with stories about the bookstore, customers, and the typewriter. There are some really neat photos in throughout the book too; the street corner, the violin monster, the typewriter, customers, the street from 1955 and much more. I have read Notes From a Public Typewriter twice, flipped through it many, many times and have shared some of the typewritten quotes. I love this book and I hope there are more to follow as people continue to type. 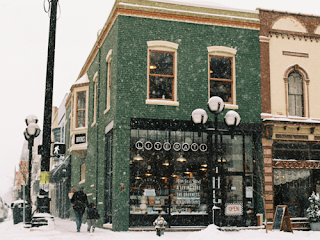 If you are in or near Ann Arbor (Go Big Blue), add Literati Bookstore to your places to stop. You will not be disappointed and I am sure you will fall in love with it just like did. 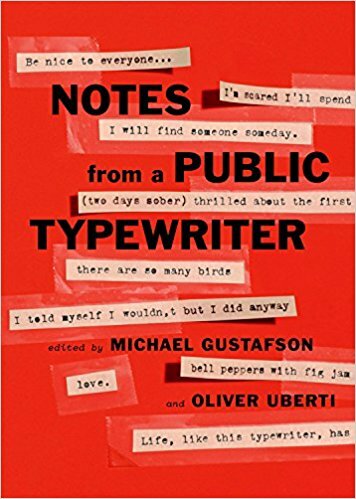 In the meantime, grab the book, Notes From a Public Typewriter to see what you are missing. My family is going up to Michigan in three weeks and I can't wait to stop by this gem of a bookstore. My son was with me on my first trip and I can't wait to take my twins there too. Funny: Where is the power button? Advice: Be kind to everyone ...for we're all walking around with unknown issues. From a Literati Bookstore fan! : This is my favorite corner in Ann Arbor. Michael Gustafson is the co-owner of Literati Bookstore, an independent bookstore in Ann Arbor, Michigan. 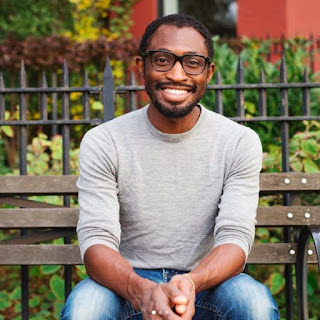 He lives in Ann Arbor with his wife and Literati Bookstore co-owner, Hilary. Synopsis (from Amazon): When you read this book, you will make many assumptions. One (or more) Sentence Summary: Holy cow....what a great suspenseful book that kept me on the edge of my seat. The Wife Between Us has so many twists, you will not be able to figure it out on your own. I thought I knew what was going on, nope. I thought I had it figured out by the end, wrong again. This would make a great movie! The Wife Between Us is a MUST read! Would I Read Other Books by the Author: I would love to read another book written by Greer and Sarah! Greer Hendricks spent over two decades as an editor at Simon & Schuster. Prior to her tenure in publishing, she worked at Allure magazine and obtained her masters in journalism from Columbia University. Her writing has been published in The New York Times and Publishers Weekly. Greer lives in Manhattan with her husband and two children. 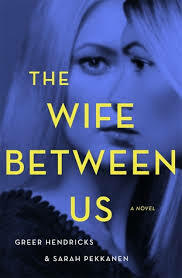 The Wife Between Us is her first novel. Sarah Pekkanen is the internationally and USA Today bestselling author of seven previous novels. A former investigative journalist and feature writer, her work has been published in The Washington Post, USA Today, and many others. She is the mother of three sons and lives just outside Washington, D.C.
Synopsis (from Amazon): The second holiday love story in New York Times bestselling author Richard Paul Evans’s Mistletoe Collection. At thirty-two Kimberly Rossi, a finance officer at a Lexus car dealership, has had her heart broken more times than she wants to remember. With two failed engagements, a divorce and again alone with no prospects, she hardly seems the type to dream of being a published romance author. Dreading another holiday alone, she signs up for The Mistletoe Retreat, a nine-day writing retreat in Burlington, VT. Deep inside Kimberly knows she’s at a junction in her life and it’s time to either fulfill her dream or let it go. The other reason she decides to attend the conference is because famed romance writer, H.T. Cowell, once the best selling romance writer in America, and the author whose books instilled in her the desire to be a writer, will be speaking in public for the first time in more than a decade. In one of her breakout sessions Kimberly meets another aspiring writer, and one of the few men at the conference, Zeke, an intelligent man with a wry wit who seems as interested in Kimberly as he is in the retreat. As Kimberly begins to open up to him about her stories and dreams, she inadvertently reveals her own troubled past. As Zeke helps her to discover why her books fail to live up to their potential she begins to wonder if he’s really talking more about her life than her literature. But as she grows closer to him, she realizes that Zeke has his own darkness, a past he’s unwilling to talk about. 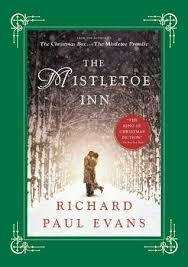 The theme of The Mistletoe Inn is that like literature, relationships must be lived with passion and vulnerability to succeed. One (or more) Sentence Summary: Mistletoe Inn was an easy and enjoyable read. I didn't realize until now that it was book two of a series. Given that, it didn't take anything away from the story and it stands on its own. I liked the characters, especially Kimberly and her dad. The story was pretty predictable once it got to the writers conference. I also just found out Mistletoe Inn was made into a TV movie and I believe it is available on Netflix. I will be checking it out! Would I Read Other Books by the Author: I have read many of Richard Paul Evans books and find them all enjoyable. I will read other books by him, including book 1 and book 3 of the Mistletoe series. 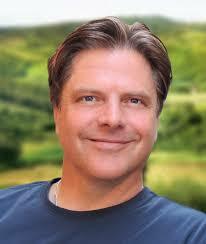 Richard Paul Evans is the #1 bestselling author of The Christmas Box. Each of his more than thirty novels has been a New York Times bestseller. There are more than thirty million copies of his books in print worldwide, translated into more than twenty-four languages. He is the recipient of numerous awards, including the American Mothers Book Award, the Romantic Times Best Women’s Novel of the Year Award, the German Audience Gold Award for Romance, two Religion Communicators Council Wilbur Awards, the Washington Times Humanitarian of the Century Award and the Volunteers of America National Empathy Award. He lives in Salt Lake City, Utah, with his wife, Keri, and their five children. You can learn more about Richard on Facebook at Facebook.com/RPEFans, or visit his website, RichardPaulEvans.com. Synopsis (from Amazon): In the long-anticipated novel from the author of the critically acclaimed Beasts of No Nation, a revelation shared between two privileged teenagers from very different backgrounds sets off a chain of events with devastating consequences. One (or more) Sentence Summary: When I first heard about Speak No Evil, I was told it was a coming of age book with a collision of culture, race and sexuality. I couldn't agree more. Speak No Evil is all that and much more. It is a very relevant book of our world today and is so well written. I would love to see this on schools reading lists. I immediately was pulled into Niru world and felt his struggles. Next, I was pulled into Meredith's world and the connection she had with Niru. I was stunned by what we find out from Meredith that I never saw coming. I won't spoil it for you. Speak No Evil is a must read book. Would I Read Other Books by the Author: Yes I would and I hope there are many more to come. 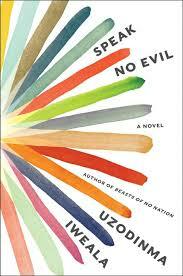 Uzodinma Iweala is also the author of Our Kind of People, a work of nonfiction. He lives in New York City and Lagos, Nigeria.